This indicator shows the position of the select lever. 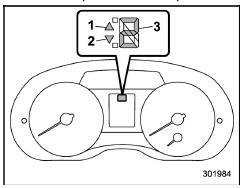 When the manual mode is selected, the gear position indicator (which shows the current gear selection) and the upshift/ downshift indicator light up. Refer to "Continuously variable transmission"